It’s even possible you got this message repeatedly right up through that Masters degree you got. It occurred to me this morning that I have unwittingly created a pattern for myself in this column. Without paying it much mind, I’ve done exactly that. I tend to write what I know. Possibly you caught on quicker than I. Maybe a few readers have now stopped to take a glance back at my previous columns. (I hope you have, but if you haven’t I would be honored if you took a moment to do so. This column is a personal favorite.) I may not be writing what I “know” per se. In short, everything I’ve put into this column has to do with my passions. The opinions I hold close to my heart. The values I try hard to live. The people and things that I love.The story here isn’t so much about what I may or may not know to be fact. Rather, my story today is about how this conclusion came along in a sneaky way to tap me on the shoulder. That is if you want to be kind. You might point out that it smacked me upside the head if you don’t. Each morning before I get down to business in front of my keyboard, I putter about doing an assortment of household business. On the day I picked my subject for today’s column, my task was taking the recycling out to the curb. It was a soft foggy morning. Thinking ahead to my to-do list I headed back towards the house. On my way up the front steps I heard a woody, tappy-tap, staccato sort of sound. Maybe this was what grabbed the attention of the musician in me. The source turns out to be a woodpecker in the small tree just off the side of my porch. As far as I know they usually like dead trees. This tree is not dead. What’s more, I think of woodpeckers as shy birds. This little fellow is not more than six feet off the ground and busily having himself a breakfast feast. I can’t help being fascinated. I’m amazed by the rapid whipping of his head. I watch until he flitters away, having finished his meal. I stand stock still for so long that I’m certain I’m not what frightened him off. I consider all sorts of nursey-sciency-nerdy sorts of reasons why he left. I wondered two things. First, what kind of woodpecker was this guy anyway? Second, why didn’t he knock himself out cold while picking out his breakfast? 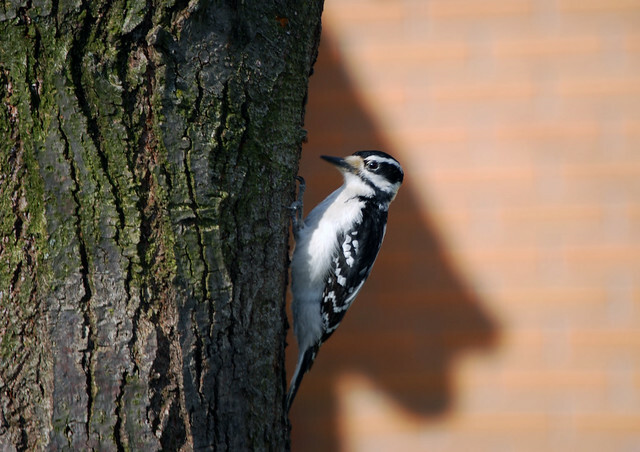 The first website I went to told me that my bird was a Hairy Woodpecker, interesting because he didn’t look hairy to me. Also he is less bold than other woodpeckers and doesn’t usually show up at bird feeders. Good information, but not what I was looking for. Next I tried Googling this: Why don’t woodpec… That’s as far as I got before Google filled in the rest of the sentence. Astonishingly: “Why don’t woodpeckers get brain damage.” More amusingly this was followed by the term “headaches.” Apt. I’m sure I’d have one of those too. Ask a biologist seemed like a reliable source to answer the question. In short, the woodpecker’s head is a finely crafted bit of biology. For my part, I was amazed at how the form of my skull versus the woodpecker’s skull followed the unique functions of each. Whether you believe in God, evolution or whatever this is still a remarkable feat of engineering, exquisitely designed to fulfill its role. Now, all of this may not have involved writing “what I know.” Certainly it wasn’t knowledge I previously had. Obviously I knew nothing about my little feathered friend’s anatomy and physiology. This caused both fascination and curiosity on my part. The infinite variety of the natural world constantly piques my interest. A passion, if you will. Thus I had two thoughts as I watched the goings-on in my tree. First, that not only was I intrigued enough to want know more about my little woodpecker. Second, that there might be a story in this. It wasn’t what I know that inspired me to write. It was something mundane yet amazing in my own back yard. It was a moment of quiet joy in the bustle of a day. Maybe all it really boils down to is that I am a late-blooming, tree-hugging, wannabe-hippy, geek-girl who was born a generation too late. It doesn’t really matter. What I do know is that I had a little moment of peaceful appreciation right there on my steps while putting out the trash. I thought I’d share. Kathleen Ronan is a writer and a specialist in meditation for medical applications, a harpist, a bookworm, and a renaissance woman. She is Assistant Editor at Magnificent Nose. Photo by webhamster, via Flickr. FINALLY getting around to reading this one, and I love it! I love woodpeckers. Fascinating creatures, to be sure. But I do have to mention that you do have one detail wrong. I was NOT brilliant in chemistry!! I was, in fact, the Breaker of Equipment! The BEST thing to come out of that dreadful chemistry class was definitely my friendship with you! !